This layout was started as a quick build for our SLS stand at Warley where it attracted a bit of "have a go" interest but less than hoped. It is also proving more problematic, and complicated in practice, than the pre-build intention. The first write up is on my own website at https://www.island-publishing.co.uk/2018/11/18/model-railway-update/ however, due to some unrelated issues with the Wordpress installation I haven't been able to update it subsequently on there. In actuality I have added an extra point/siding at the right hand end to allow loco swaps and the long siding has the half curve swapped with one of the half straights to widen the vehicle loading road. The points are currently wire-in-tube but I have bought point motors to fit in the next week or two once everything is finalised. Originally intended to use up track I had in hand (all previously unused apart from the Y), have a single power feed and reliance on the points for isolating the sidings so that there was almost a zero cost to the build it hasn't worked out that way in actuality. The points, a mix of Hornby and Peco Setrack plus the Streamline Y proved hopelessly unreliable for contact and have been converted to semi-live frog so as to reliably connect electrically. The track is currently loose pinned, it runs OK but I have it to wire now so that sidings can be isolated electrically. I have also bought an ironing-board for it to sit on. This will give a quick and easy way to erect and dismantle it as for home use it has to fit into a spare bedroom and be easily dropped and stored in the garage when the room is required for family visits. where is the panel for the stud/probe and section switches going? under track magnets yes/no - and if yes where to place and what type? which of four/five possible locations, none in reality rail served, in the York area it will become when I get around to starting the scenery. It will almost certainly be a bud, off a twig, off the Foss Islands branch although there are a couple of other options I'm pondering on. The couplings/magnets issue is the key puzzler. Currently I use tension looks and the usual manual hook from the sky. I would like to fit magnets for auto-uncoupling as a future option but which type? Whatever is chosen as the future option creates a need to fit the under-track magnets now, before the final track laying/ballasting is done, even if the actual conversion of any wagons isn't for months. A 1960s style (HD/Tri-ang) coupling converter barrier vehicle will also be needed between loco and the set of wagons converted for this layout if taking this route as they will be used un-modified on passenger sets etc., elsewhere. Sprat and winkle: I bought a set of S&W etches a few years ago but after starting work on one wagon realised the extent of work required and did not progress conversion. S&Ws do give delayed action when pushing a wagon. (unlikely to be the final choice). The wire staple method: appears to be fairly quick and simple but requires a magnet at every possible dropping off point as there is no delayed action. Kadees: possibly the best option long term with contemporary wagons coming fitted with the necessary pockets to swap. However, where to put them in the sidings is the issue. For propelling moves one under the yard throat is obvious but for splitting stock in the sidings their position is a ? Asking around about Kadee use in practice also suggests the necessary fixed magnets can pull light rolling stock towards the magnets! Do nothing until next layout - remains on the list as it is definitely the easiest option and has no extra costs. Two images of the pre-scenery "as built" section. Firstly, what will be the scenic end. Lots of ideas but nothing yet fully finalised. Track deliberately laid to not be parallel to the edges. The stepped edge to the scenic break was in case of a need to fit a point motor (it has needed one) and all to be disguised in due course with a building. The reason for no cork tile or other under track barrier is the line will be finished in a mix of ash ballast and concrete roadway in-fill. Neither needing a noticeable shoulder. Size as measured 1230mm (4ft 1/2") x 310mm (1ft 3/8ths); the source for the base timber was a ready made shelf I had in store, which I am assuming was made/cut to the metric size so that is put first. Fiddle yard end. The long siding will just hold a single coach and 0-6-0T / diesel shunter for a workers train if working to a sequence not just shunting. The centre - two brake vans for a brake-van special or a second, short, loco. The one nearest the camera the head-shunt. My intention is to fit a velcro fastener buffer stop for the inglenook shunting limit, position variable according to length of loco in use. Well done. I'm following your work with a great interest. Will post a few more pics in a few days. Having seen this post http://www.rmweb.co.uk/community/index.php?/topic/139337-nem-kadee-couplers-for-uk-stock/ looks like Kadees/Kaydees, like the Sprat & Winkle, are a hassle to fit too. I think this is going to continue to be a hook and hand from the sky layout for uncoupling. However, magnets seem to be fairly cheap, so I may well put some in as future options for the staple method. Such a shame when Tri-ang merged with HDublo they ditched the better option of the PECO couplings; I guess to save the patent fee. It was dry today so I used the day to work outside modifying the baseboard to make it suitable for wiring in the necessary isolating sections with everything underneath: a full update is on my website which is now back working again even if not 100% restored. The relevant post is here - https://island-publishing.co.uk/wordpress/2019/01/23/phoenix-yard-progress/ There is a little bit more to do, and the new sections need painting black, but it is one step nearer starting the scenics. I have added side rails and cross braces, 11mm ply with a 65mm depth. 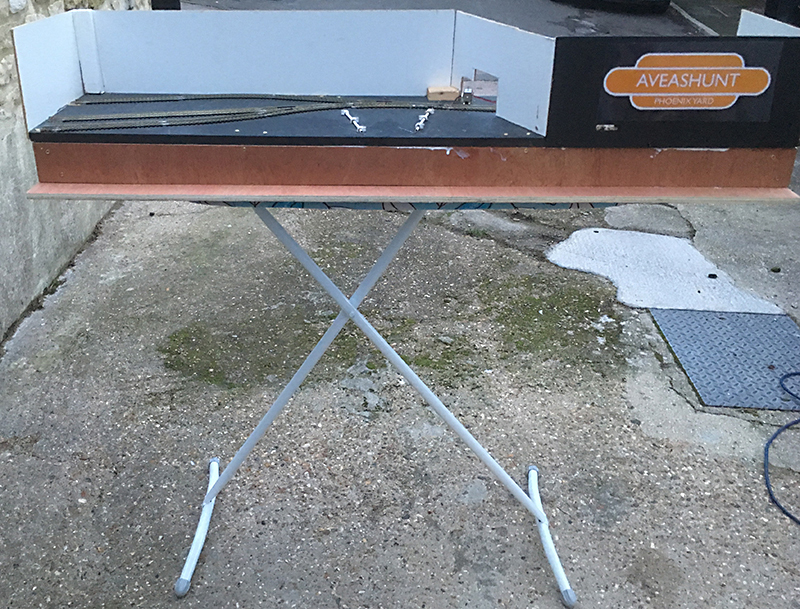 I have also offered up the layout to the ironing board intended to be its' sub-structure. The track plan is also having an additional L/H point added into the fiddle-yard. It won't go anywhere for now but is to facilitate addition of an extra L section to add more off-scene storage/stock interchange and to vary the basic eight wagons being shunted. As I am also having to add isolating/switched sections due to the insulfrog points proving unreliable I have also decided to swap the wire-in-tube for point motors. I know both of my brothers-in-law would have produced much, much, better outcomes to this woodwork job but as they are over 300 miles away I had to do it myself! The layout is also to sit on an ironing-board, a bit like Peter Leadley's Briding Noora as I wanted a quick and easy sub-structure. Whether the experiment works or not is something only time will tell. If it doesn't I do have spare trestle legs (from Screwfix) already available and a fold up picnic table but they are both a bit too low. I think the L side extension will aid stability and reduce wobble/topple risk. I would also like to add a bit of height to the back scene, what looked OK when I added them now looks to be too low. I have the hardboard, just a case(!) of adding it on. The fresh timber (as in post above) now coated in black to seal it. However, despite two coats now applied to the underside prior to wiring, I've noticed there are still a couple of bare wood patches in the corners where I've missed a bit! This looks like an interesting project. I will follow with interest. I really like the layouts name on the fiddle yard board. it put a smile on my face when I realised what it was saying. Another uncoupling system that may be worth considering is Roger Nicholls 'Yorkshire Kadee' system (as it is known). It is extreemly simple (and cheap!) but works very well with Inglenook Sidings type of layouts where the points all face one direction. It operates with hook and bar type couplings, but involves removing the hook from one end of the stock. A tuft of bristles is inserted in a hole between the sleepers at uncoupling spots. When the wagons are pushed over the tufts the hooks are lifted, but when pulled the hooks pass straight through the bristles and the wagons remain coupled. Hopefully the image below will make things clear. A couple of tufts can just be seen between the sleepers on the two tracks, and were installed after the track was ballasted. I use plumber's hemp for the bristles but other materials could be used (I believe RN uses Woodland Scenics long grass). The tufts are held together with glue and cotton and are a snug fit (not glued) into holes drilled between the sleepers, where they can be adjusted by moving up or down slightly. A spare untrimmed tuft can be seen on the platform. One downside for a 'have a go' layout might be due to the small size of the uncouplers. Quite slow and precise control is needed to avoid overshooting the tufts when uncoupling. Thanks for that. I'd not seen that described previously. Interesting experience yesterday as I went to buy some gun barrel colouring treatment as suggested in this post On track weathering. Not being of the shooting persuasion, either of wildlife or of clays, when I went into the local gun-shop in Dorchester I expected that there would be a discrete area where you had to ask to enter if you wanted to actually buy one. I was not expecting to be immediately faced with about 50ft of wall space racked out with a vast array of shotguns etc.!! I did get a bottle of the Gun Brown but I will have to wait to try it out as other things are currently getting in the way of finding time for the next spurt of modelling. Looking good John. I always liked the concept of a layout which would fit onto an ironing board. I recall (years ago) seeing a layout on an ironing board, which I think was called "Binnigor Road"
With nothing possible to be done physically on the layout for a week or so whilst it is in temporary storage thoughts turn to the next step regarding scenery. This should allow for both coal and oil deliveries for fuel, box vans for the product and probably molasses tanks. More to research. I have now established in my own mind the fictional/fictitious location for this yard. Blue – When the DVLR was authorised a spur to the NER's already extant Foss Islands Branch was authorised but not built. Red – For modelling purposes I have assumed the reason it was not built was that this short spur to serve the industry north of Hull Road was already in existence. It would have been built in the 1880s to coincide with opening of the Foss Islands Branch. 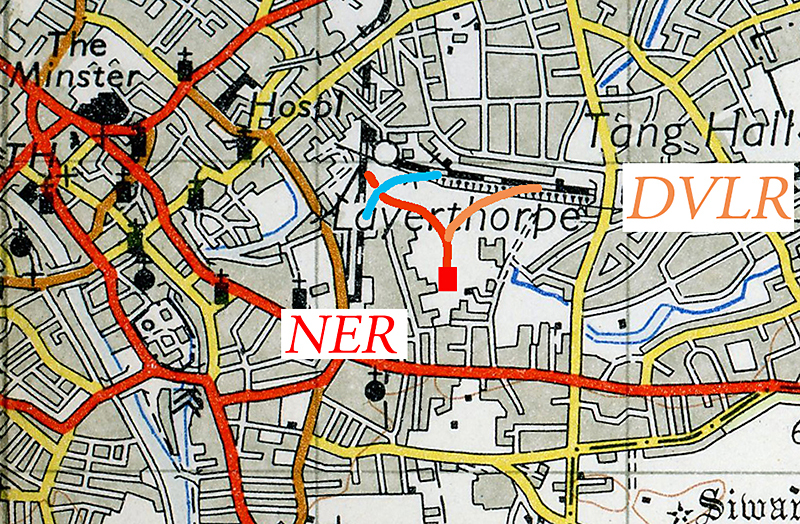 Orange – an assumed DVLR built substitute for the blue spur that had been authorised but not built. A bit more about this general area, with opening and closure dates for the real railways it would have linked to, as shown on the above map, is now in a blog post on my own website. Copyright statement: The base map is OS Sheet 97 York 1955 edition. Crown Copyright (Expired) is acknowledged. This layout - to DCC or not DCC? I think the various options outlined in the DCC for Dummies thread has convinced me that for this specific layout switching to DCC is not an option. Too many of my locos are analogue, and if running already DCC chipped locos in DC analogue mode is not recommended then it isn't worth it at present. I had hoped to stay DC in the short-term whilst slowly chipping the DCC ready items for a future change over. What it did do though is convince me it is the way ahead long term. My currently mothballed 07 layout (Pebbles End) was built as DC but would benefit from going DCC and cutting out the multiple section two way switches for cab-control. Only 6 locos, but as they are N gauge chassis and small bodies possibly no room for the chips and sockets! Plum Hollow too, a layout starting in N so not the large, back catalogue conversion problem, that exists with my 40 odd years worth collection of OO locomotives. See the March blog post on my own website for pictures of a Dapol crane resurrected from long term storage. Modelling progress on this - next step is to do the wiring then stain the rails with 'gun brown'. On hold currently as I have been doing a lot of design and typesetting work for the latest SLS Journal and getting the Society stand ready for the Ally Pally show. Considerable railway related input - but non-modelling. Link to the Dapol crane post added. For such a small layout, re the DCC question - you could also ask yourself "How many locos will I be using on this layout?" So I started acquiring newer locos, and installing decoders one by one. Agree Marc; my issue is working out when to swap over. The cusp option of DCC chipped locos running on DC, seems to be a no-no, it can be done but most advice is not to try it. I've a Peckett and an 08 I could chip now, they'd be ideal and were bought DCC ready. The Q6 and K1 are oversized for it. Everything else suitably sized for Phoenix Yard, in either era, is pre-DCC. This one will probably only ever have two locos at a time on scene, with perhaps a third in the fiddle yard, but allowing one to stand anywhere, while the other runs, cries out for DCC rather than IIRC the eight switched sections analogue needs at minimum. However, this doesn't justify the cost. My other still extant layout (mothballed but not scrapped), the 07 15" gauge one, cries out for DCC. It was wired analogue nearly ten years ago but is a cats cradle underneath due to twin cab-control for each section. Only 6 locos on it, but all are pre-DCC and chipping will be a nightmare as the bodies on N gauge chassis are so small. At some point I think I will be swapping, if I can afford to. I now appreciate that there is a very good case for DCC, even without enabling sound, but it is how to manage the upgrade path without bankruptcy that's the problem for existing analogue modellers. I am guessing a way forward might be to slowly add retro-fitted sockets to my existing locomotives and add blanking plugs, maybe even buy chips but not fit them, until the majority of the fleet for a project are ready. Then make the switch. I even toyed at one point with the idea putting a DCC fitted motor bogie up a van, taking the motors out of some of the older locos, and using the van coupled to them as required for the powered traction as people did in the old Kitmaster kits era. It was what I first thought Hornby had brought out, before I read it was just a static sound fitted item! I got my first DCC controller, a Bachmann EZ command for an OK price - then found a backup one, going cheap 2nd hand - so I bought it! Funnily enough, pals have commented that I'm still using that rather basic controller, as opposed to a more upmarket model. Thinking about this as I'm typing, it sprung to my mind that I was in a similar situation a few years back. These two recent threads (DCC for Dummies & DCC Controller recommendations), and posts above, have convinced me that we are still (with DCC) in a situation paralleling the the pre-IBM PC/MSDOS era in early computing. Too many systems to chose from and only the cheapo' Hornby Select option getting (predominantly) poor reviews. However RedgateModels' post here does imply even that option has a place for beginners if you don't need sound and anything particularly advanced. My conclusion - Still probably best for me to sit it out as this layout doesn't really need it. That said, as and when I have the top off locos, adding DCC ready ability is probably a good future proofing. Background research is still on going. Thanks to Neil Rushby for reminding me of these buildings opposite Clifford's Tower. From these photos I may have an option to add some genuine York industrial buildings to my backscene. Very rough montage from photos taken a few days ago when I was up in York and they are needing a lot more work in Photoshop to de-skew tilting issues in the images. At least with the leaves off the trees the editing is considerably reduced. Not yet sure I will actually use these but it's an option. The twin chimneys on the lower (RH half) of the full image are an error from the automated photomontage filter. Finally took a break from other activities today and have made a bit of progress on the physical build part of the layout. The track is now relaid to be DCC﻿﻿﻿ ready on the principle of plenty of isolated breaks (plastic fishplates) which is next to be wired with droppers. I've done it now as once the ballast is down in due course I wouldn't want to lift it to retrofit DCC options. I have also added a further point on the back-road in the fiddle yard that will enable a future extension into an L format without relaying track. Goes nowhere for now, but can. Interesting observation relevant to the thread on internet - v - local shop. I discovered I was either out of plastic fishplates or couldn't find the one's I have (more likely). Quick trip to local toy/hobby store on the bus, got plenty to keep me going without waiting for postal deliveries. However, it was fortunate I didn't want the OO metal type as they'd only got them in N. Outcome, I got what I wanted with an hour's round trip and at least 24hrs before I could have got them by mail-order, but with small stores that only re-stock every few months it can be random chance that they've got what you need if it's getting close to their reorder/restock time. It was and the wiring bus is now in and some of the droppers added. However, the next update/work on this project won't be until after the York Model Railway Show as have been sidetracked sorting out our SLS stand for the show. (Stand 4 - on ground floor next to the show admin/step stool hire point).